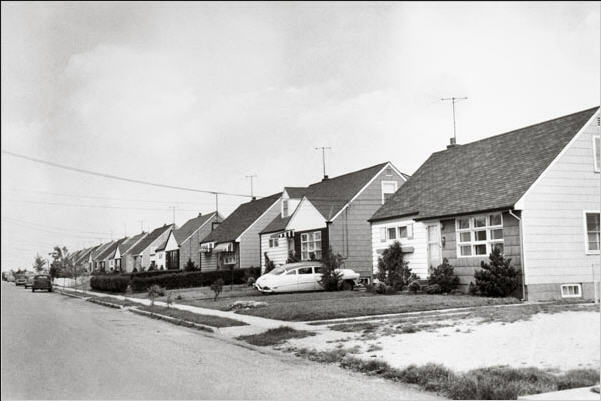 The post-war sprawling suburbia that American planners love to hate started of with the runaway success of the first Levittown in New York. Just over 60 years ago in the US, returning G.I.’s made up the bulk of a huge pent-up demand for housing. The government introduced legislation that virtually guaranteed financing to residential developers and making housing loans easily available that . 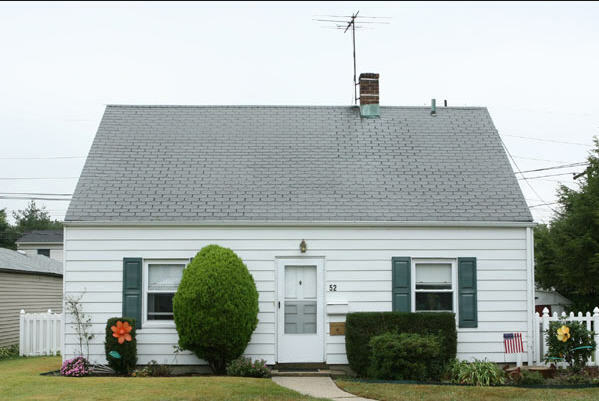 Developers like Bill Levitt responded with very affordable little houses for under USD8000. And they could be purchased with a low down payment (or none) and low monthly mortgage payments spread out up to 30 years. 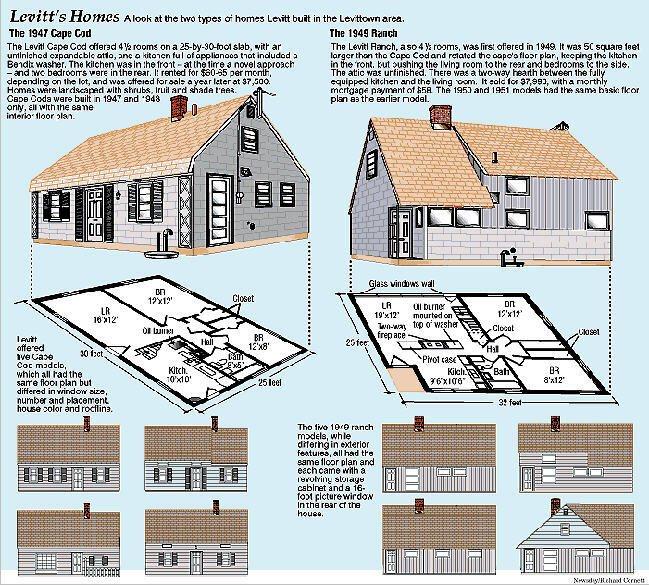 Levitt was able to offer these houses so cheaply because he was applying construction methods perfected in the deployment of prefab housing in the armed services during World War II. Bill Levitt had learned the techniques of rapid construction using standardized parts, tightly controlled suppliers of goods and services, and a workforce with highly specialized skills. He took the mass-production assembly line and converted it so that workers moved from site to site doing their specific targeted tasks. The Levitt house combined extreme economy and the promise of an appropriate living space for an American family. Small at first, it could expand with time-- upward, first, then outward. Only the downstairs was finished: a tiny, two-bedroom detached dwelling on a concrete slab, with stairs to an unfinished "expansion attic" which could be converted with ease into a third and perhaps even a fourth bedroom, under the eaves. These houses were arrayed along curved streets, rather than the rigid grid plans of older towns in the US. The new suburbs became sub-communities. Larger 'distribution' roads, that served to direct traffic around rather than through neighbourhoods, formed one set of boundaries. The parks or larger open areas formed centres of gravity drawing children and, inevitably, parents. This was the locale for tight social connections. 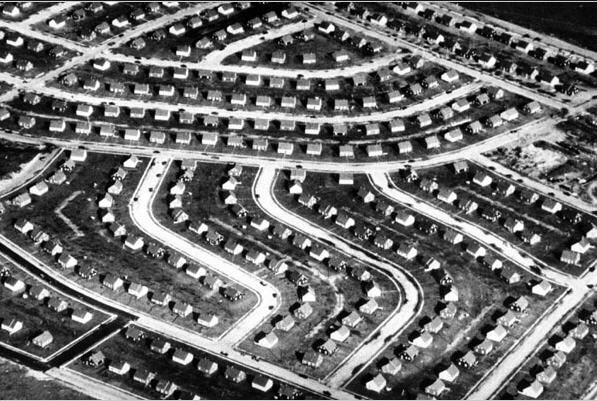 Right from the beginning Levittown and suburbs like it have been criticized for the lack of natural features, cookie-cutter designs, social class homogeneity and racial racial exclusion (in the early years). But these were houses rapidly built to satisfy a desperate demand; housing cheap enough for newly returning GIs; houses that were small enough to be convenient and easily maintained, large and expandable enough to accommodate growth in family and in wealth; houses that drew the family into a common area (often around the built-in TV); a community that embodied the child-centred and optimistic values of the post-war boom. In America there still is so many housing developments that use these same standards even to this day. Or standards that are like them. The suburbs around the cities are full of homes like this. Then times of course change and the homes got bigger. But still developed on the same idea. I think that the housing market will have to swing back to cheap small homes again. People can not afford the cost anymore. I can still remember buying a home for $18,000 dollars and years later selling it for $75,000. I bet those days are gone for awhile now. For your Online Loans, you can also try Payday Loans Online - A personal loan resources and financial services portal plus an online directory for financial products and services. We have every kind of personal loan imaginable. The following sites promote what they think are the best companies for your personal loan and financial needs. These sites rate their recommendations for customer service, speed, best rates, best payback terms, security, and ease of transaction. I grew up in Levittown NY. It was like a hands-on sociology course. People from the city who didn't live there (like one of my boyfriends) described it as "Leave it to Beaver/Norman Rockwell." However, most of the people who did live there came from the city, and brought city attitudes with them. I live in a diverse part of the South nowadays; people complain about minorities, but I can attest that growing up as a white kid in a 96% white community does nothing to shield one from ugliness, violence, gang activity, crime, etc. In Derry (as in Levittown), it was always thirteen o'clock. Moved out 27 years ago and NEVER looked back.